Send a Voice Message to Atheist Republic! We would love to hear from you! You can start recording your message by clicking on the green button below. Make sure that your microphone is ready! The recording application provides you with the option to leave your email after recording your message. If you would like to hear back from us, leave your email and we will get back to you. Your questions and comments might be shared with the Atheist Republic fans and community. We have numerous admins that work hard to turn our closed groups into communities. If you have a compliment, complaint, concern, or general feedback you’d like to give our admins, you’ve reached the right place! We take this information very seriously, and appreciate you taking the time to make our community better. Your submission will be reviewed by a panel and addressed in an appropriate manner. Your submission may be used and shared anonymously for training purposes. Please give us your feedback on an Atheist Republic closed group. Be very specific about which closed group or admin you are referring to. Note : By leaving a voicemail, you are allowing us to broadcast your message on any of our platforms. Atheist Republic is open to interviews and speaking engagements. If you'd like to talk to us, please check out the following bios below and contact our available Atheist Republic Speakers. Armin Navabi is a former Muslim from Iran, author of the best-selling book Why There Is No God, a host on the Secular Jihadists podcast, and the founder of Atheist Republic, a non-profit organization with over one million fans and followers worldwide that is dedicated to offering a safe community for atheists around the world to share their ideas and meet like-minded individuals. Allie Jackson is the CEO of Atheist Republic. As a passionate activist, she has worked with organizations and people to remove the stigma of being an atheist, and expose the ignorance of blasphemy laws. Through her work, she saw the need for global communities and a one on one private support group, so atheists can unite in person and help their communities, while also gaining access to personalized support. 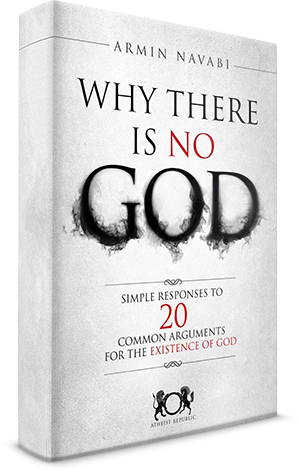 If so, Atheist Republic would like to publish and promote for you! Click here and see if we can help! Use only headshots for the Testimonial Image. Images must be at least 100px square to a maximum of 220px. Please limit file size to a maximum of 1MB. Images must be between 100x100 and 220x220 pixels. Would you like to sign up below for our email newsletter and stay up-to-date on all the great Atheist Republic content? We love our fans, and we want to give you a chance to show how much you love Atheist Republic. Upload a photo of yourself, your family and/or your friends showing off the Atheist Republic name, website, logo or all of the above. Get creative! Use paper, your computer, your body, your sidewalk, a light pole (keep it legal)…the possibilities are endless. We'll post your fan sign on our Facebook page. But submitting your photo, you are granting Atheist Republic permission to use it in promotional materials in print and digital formats. Upload your Atheist Republic Fan Sign Here! Please double check the spelling of "Atheist Republic" to ensure we can post this upon submission. FIlesize for the image must be 400kb or less. Great interesting new field for my curiosity. I'm interested for it very much. I`m so happy to be in such group, with the people with a same opinion. An individual is powerless against oppressive regimes of their country. The only long-term solution will come with education which is why sites like Atheist Republic are so important with the ability to bypass national frontiers and oppressive regimes! I was raised in a very conservative Christian background – Jehovah's Witnesses to be specific. When I was about 17, I joined facebook like any other teenager but with an added twist. I had been doubting the religion of my family for quite some time. Long story short, if it wasn't for Atheist Republic, I would still feel like religion is a life-preserver instead of understanding that it more resembles a noose. I owe you all so much for saving me from the barbaric ideals that I once held as holy. Thank you, thank you, thank you! Please keep up your amazing work. Groups like yours help atheists unite and allow us to have open minded discussion without fear of reprisal. I grew up in a muslim family where traditions are followed blindly. My family follows Islam with all their heart and energy. I also used to be the same till I started finding reasons and logic behind the teachings. No one in my family or circles know about me being an athiest. I find this a good platform to share my views and know more about the facts one should know and to increase my knowledge base. I had false hopes for years, I saw friends of mine praying in vain, I questioned the existence of god to no avail. No one gave me answers. With AR, I have read, I have come to understand so much more. I love that I got to know about this site. I'm from The Netherlands. We have no such thing here as Atheism forums or websites, for the simple fact we have too many Atheists here I guess. I'm proud of all the work you guys are doing, we can not have enough atheists! It is growing worldwide.